CalDigit's Thunderbolt Station 3 Plus is taller, but not as wide horizontally as most of the shipping Thunderbolt 3 docks. A major complaint about the others is the fixed orientation, minus a specialty mount or some adhesive velcro —but like its predecessor, the new Thunderbolt Station 3 Plus can be positioned vertically, possibly saving some desk real estate. or making it easier to stash behind a monitor. Like all of the Thunderbolt 3 docks, the power supply is pretty giant. Also, like most of the docks, there's an enclosed, short, passive Thunderbolt 3 cable included that is mostly useless for more than just testing the device out when you get it. So, like with nearly every other Thunderbolt 3 examination we've done, plan on $50 or more for a longer cable in most situations in a separate purchase, or get one for a bit more bundled with the dock straight from CalDigit. Once more, CalDigit has changed up the available ports. 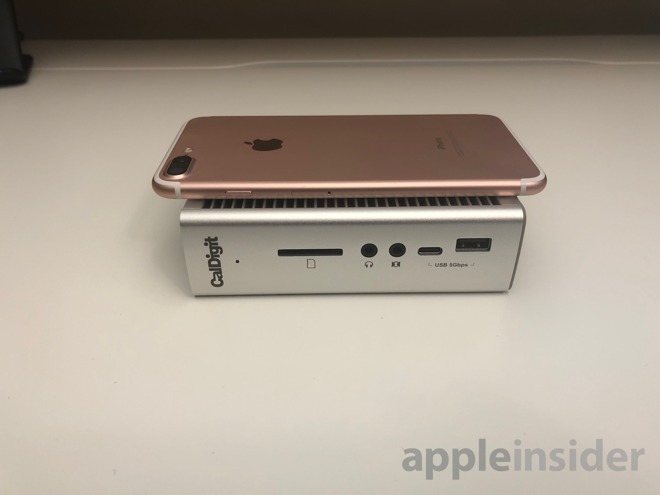 On the front, the new dock has a SD card slot, audio in and out, a 5Gbit/sec USB 3.1 type C generation 1 port, and a USB 3.0 type A 5Gbit/sec port. On the back is where the company has really changed things up. 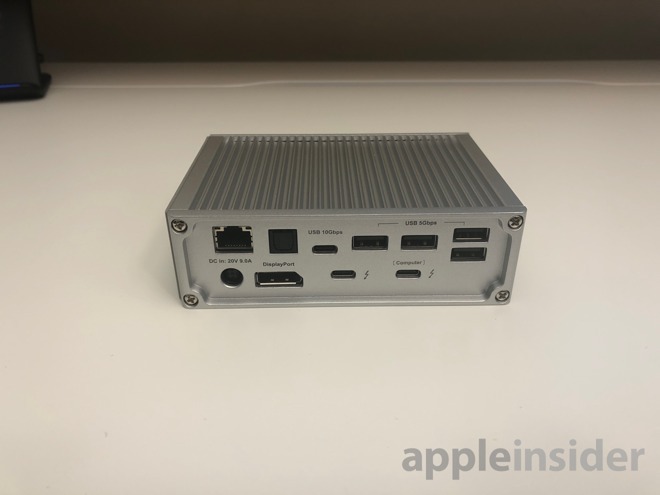 Standard ports include the two USB-C Thunderbolt 3 ports capable of providing 85W of charging power, four USB 3.0 type A ports, Gigabit Ethernet, and a 4K DisplayPort capable of 60 Hz refresh. Less common ports are s TOSlink optical audio connector, and a USB 3.1 type C port capable of 10Gbit/sec data transfer. These are all improvements over the CalDigit Thunderbolt Station 3 from 2017. The evolution of that form factor to the new Thunderbolt Station 3 Plus ditches the mostly useless 3Gbit/sec eSATA ports in favor of more USB in two different flavors, and the TOSlink connector —more than a fair trade. Initial examination of connectivity still shows good dual-4K support, with the DisplayPort and the Thunderbolt 3 pass-through port utilized for displays. This is the first dock we've tested with a discrete 10Gbit/sec USB 3.1 type C port in addition to a pair of Thunderbolt 3 ports. 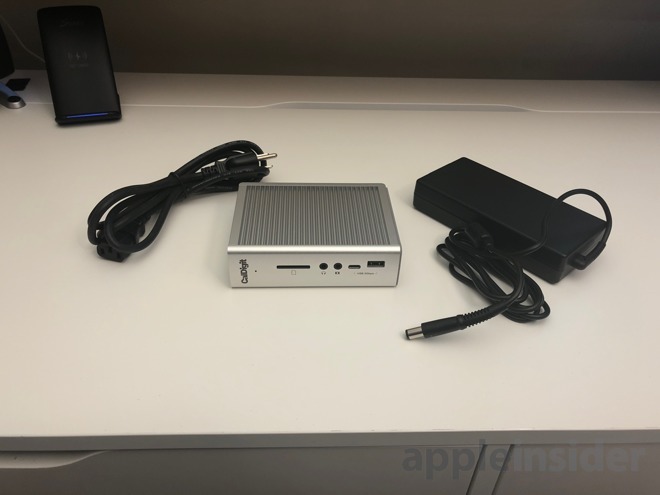 Utilizing that 10Gbit/sec port, when the dock is connected to a USB 3.1 type C SSD capable of 750MB/sec read speeds, the dock delivers in excess of 480MB/sec on both the USB 3.1 type C port, or the downstream Thunderbolt 3 port. We've only performed rudimentary examinations of the TOSlink port, and have yet to evaluate the speed of the SD card slot, check the USB-A ports for UASP, test connecting two SSDs in conjunction with a 4K monitor, or how a connected SSD performs with two 4K monitors connected to the dock. 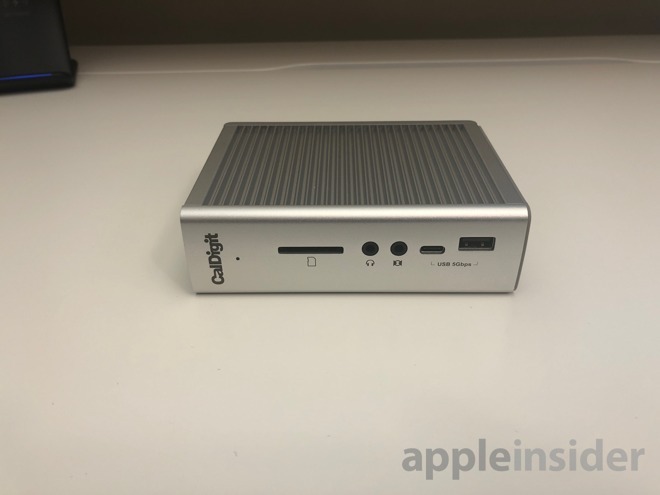 At present between the full charging power and the port array, we feel that CalDigit's new offering is a superb choice a Thunderbolt 3 Mac user assuming you don't need FireWire 800 or are clinging on to eSATA drives for reasons known only to yourself. It's far too early to conclusively call it a favorite, though, as we've only had it for a few days, and it needs more examination. The TS3 Plus is expected to ship on February 20, and is currently available to pre-order ahead of release through CalDigit's online store at introductory prices of $249.99, $269.99, and $279.99 with 0.5, 1, and 2 meter Thunderbolt 3 cables respectively. It is also available to purchase through B&H Photo. The reduced-cost Thunderbolt Station 3 is currently available to buy directly from CalDigit under the new pricing. They can also be purchased from AppleInsider partners B&H and Amazon, though as of Tuesday morning, listings at such resellers were not yet reflecting the new price.